Sprouts are one of the most complete foods we can consume. They contain the strong life force of a seed beginning its growth into a plant. With their increased nutrients, sprouted foods enable you to eat less, saving you extra energy spent on digestion and money. During the soaking and sprouting process, proteins, vitamins, enzymes, and minerals increase 300-1200%! For example, in wheat, vitamin B-12 quadruples, other B vitamins increases 3 to 12 times, vitamin E content triples, and fiber content increases three to four times that of whole wheat bread. But more importantly, nutrients begin to be broken down into their simplified form (this is what our body does in digestion to properly assimilate the nutrients). For example, proteins begin the process of breaking down into amino acids, carbohydrates into simple sugars, fats into fatty acids, while the minerals chelate or combine with other proteins. This significantly improves digestion and is why soaked or sprouted foods are considered predigested. Also, enzyme inhibitors, which act as natural defenses against bacteria, fungal, insect and animal (including human) predators that interfere with proper digestion, are washed away during the sprouting and soaking process. Fill the container with water. The food will absorb most of this water and expand. Soaking times vary depending upon the intended use. 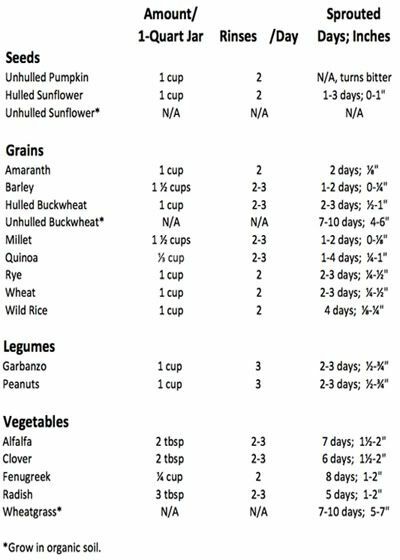 If the nut, seed, grain, or legume is to be sprouted, it has a shorter soaking time than if it is going to be consumed immediately after being soaked (see Soaking Chart). After the specified soaking time has expired, empty the soak water (plants love this water!) and rinse the nut, seed, grain, or legume with fresh water several times. If they are intended for consumption without sprouting, they can be stored in the refrigerator for 2-3 days. (Remember to blanch almonds before consumption. See Soaking Chart footnote.) If the food is going to be sprouted, begin the sprouting process outlined below. There are several methods for sprouting, including using a glass jar, a sprouting tube, sprouting basket, sprouting bag, or organic soil. I personally use the glass jar but the organic soil works much better for some sprouts (designated with a *). The glass jar method works well with all of the sprouts except for buckwheat, sunflower, and wheatgrass spouts, which are best grown in an organic soil base. People often enjoy growing a variety of sprouts in the same jar. Alfalfa and clover is one combination; fenugreek and radish is another. When sprouting, once you see the tail, be sure to taste the sprouts at each rinse cycle to see which tail-length you prefer. The days listed are rough guidelines, there's no need to follow them exactly. It's all about personal preference. Soak nut, seed, grain or legume according the Instructions for Soaking above. Drain and place in a glass jar with a fine-mesh screen secured over the top with a rubber band. This keeps out insects and allows for airflow. Place the seeds in a dark area for 24 hours and then expose to indirect sunlight. Sprouts should be rinsed 2-4 times a day, by simply filling the jar with water, lightly swishing, and draining with the screen still in place. Repeat twice. For proper drainage the jar should be stored upside down at an angle of 50-70 degrees (an angled dish rack works well). When the sprouts reach their specified length, store them in the refrigerator to slow their growth and preserve their freshness. Soak seeds or grains according to the guidelines give in Instructions for Soaking above. Place organic, compost-rich soil in a shallow tray that is 2-3 inches high. Gardening "flats" work well. The soil should be loose and 1-2 inches deep. Place the soaked, unhulled sunflower seeds, unhulled buckwheat, wheat berries, or wheatgrass in a thin even layer (1 cup of grain or seed per 10 x 14-inch tray). Cover lightly with extra soil. Water gently and thoroughly. Depending on the quality of the soil, you may want to add some extra "kelp fertilizer" to the irrigation water. Cover with plastic and place in a dark area, at room temperature, for 4 days. Water daily. To harvest, cut with scissors as close to the soil as possible because the nutrients are most concentrated in the stem near the soil. Sprouting Tip: Sometimes in the humid, hot weather, mold may grow on the sprouts. The best prevention is to rinse frequently and to spray regularly with a 3% food-grade hydrogen peroxide mist. Note: most of the information on this page is taken directly from Dr. Gabriel Cousens' book Conscious Eating. For more information on sprouts, please visit Sprout People.